The Iceman cometh – and boy does he have issues. Marvel’s newest X-Men solo comic, Iceman #1, features the exploits of Bobby Drake (the original, not the time-displaced younger version) battling baddies as well as…his parents? That’s right. Bobby has had so much trouble with his parents’ lack of understanding around him being a mutant, he hasn’t dared telling them he’s gay. Instead, Mr. and Mrs. Drake are waiting for him to bring a nice girl home. If that weren’t bad enough, Iceman is busy schooling the younger version of himself in the ways of his mutant powers. For years Bobby could do little more than creating ice ramps and freezing bad guys, but now he’s an “omega-level mutant” with powers far beyond his imagination. Older Bobby teaches the younger, hipper version of himself how to maximize the potential of those powers. And, of course, Iceman has to deal with the real bad guy, which in the premiere issue is an anti-mutant purifier. Not a Sentinel-level threat, but an adequate one in the middle of everything else going on in this story. Artist Alessandro Vitti gives the book a unique style – different from the other X-titles, but still clearly in the family. Writer Sina Grace cleverly bookends the story by having Bobby explain who he is on a dating website. “My friends would say I’m a team player,” he writes while looking at a photo of the X-Men. Grace tells a compact yet complete story for this initial outing, one that has drama, humor and enough action to keep fans coming back for more. 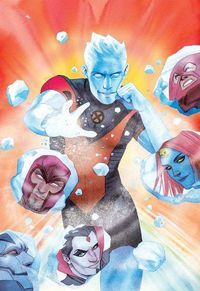 Finally, Iceman gets his time to shine and it’s one story that is sure to rank among the classics. Iceman #1: Marvel Comics, Released June 7, 2017, Written by Sina Grace, Art by Alessandro Vitti, Colors by Rachelle Rosenberg, Letters by VC’s Joe Sabino; $3.99. Previous article I Just Saw and Loved Wonder Woman — Now What?